Duke University electrical engineers have developed a metamaterial that allows them to manipulate light in much the same way that electronics manipulates flowing electrons. They say that the results of their latest proof-of-concept experiments could lead to the replacement of electrical components with those based on optical technologies, which should allow for faster and more efficient transmission of information, much in the same way that replacing wires with optical fibers revolutionized the telecommunications industry. 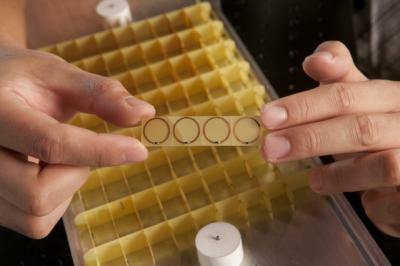 The metamaterial device is made up of individual pieces arranged in parallel rows. Each piece is made of the same fiberglass material used in circuit boards and is etched with copper circles. Each copper circle has a tiny gap that is spanned by a diode, which when excited by light passing through it, breaks its natural symmetry, creating nonlinearity. For highly intense light, certain nonlinear materials convert incoming energy into a brand new beam of light at twice the original frequency, called the second harmonic. Using this metamaterial at microwave frequencies, the researchers were able to fabricate a nonlinear device capable of “steering” this second-harmonic. The device simultaneously doubled and reflected incoming waves in the direction they wanted.